Former Facebook CTO Bret Taylor and ex-Google’er Kevin Gibbs have launched their latest endeavor called Quip. This startup aims to reinvent how word processing is done enabling users to create documents on any device they have, no matter whether it’s on a phone, tablet, or even on the desktop. And it’s beautifully well done. 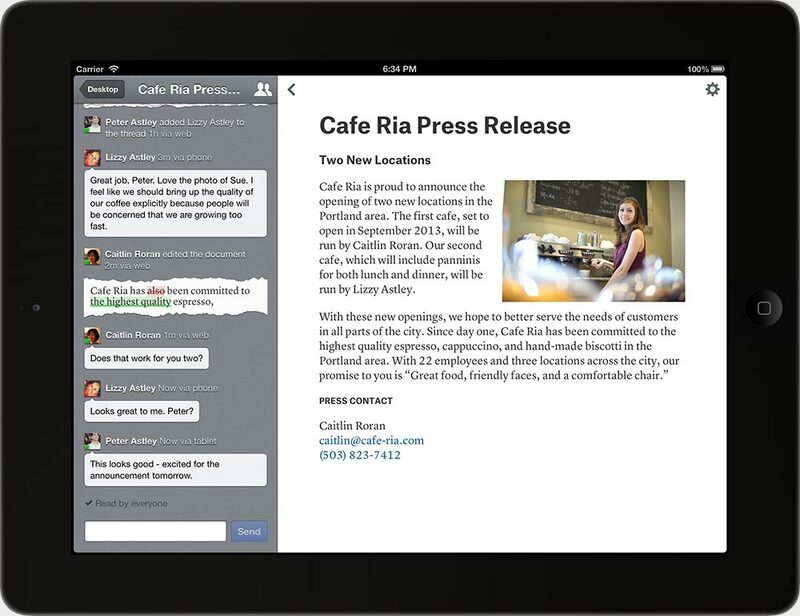 Collaboration: Quip will combine documents and messages into a “single chat-like ‘thread’ of updates” that enables multiple people to edit the same document to help streamline production time. Mobility: Available across all platforms, the product automatically detects what device you’re on and automatically formats to the size of the screen. This way everything is 100 percent visible without resorting to any pinch-to-zoom feature needed. And it also supports offline working so it doesn’t matter whether you’re sitting at a Starbucks, on a subway, in an airplane, or at your desk — it should work. Interactivity: Because you’re using a mobile device, rather than printing out the document and editing it, Quip makes it so it can all be done right from the screen in an engaging way. Take a bulleted list and turn it into a checklist so your meeting notes can be a task list. Include @mentions to link to other related documents and create a table of sales data so your team can input information into it simultaneously. 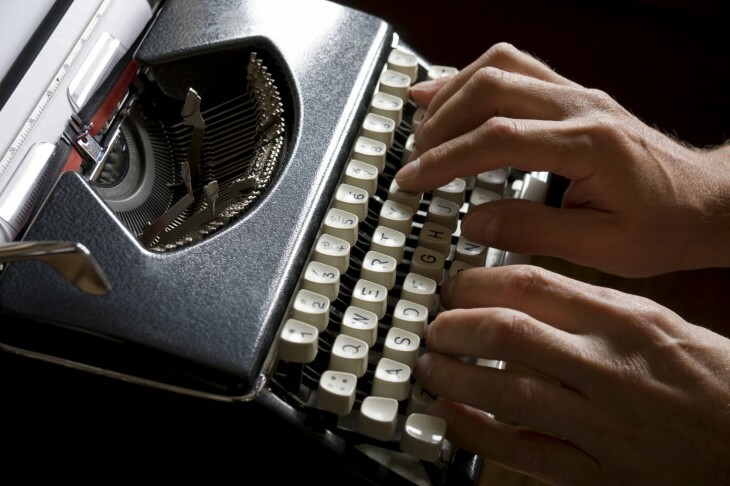 Simplicity: Remember when the latest version of Microsoft Word came out and the interface became too complex that you needed to take a few minutes to get reacquainted? Quip says that its team has worked to make sure that it has a minimal, elegant design to help you focus on writing — not ribbons (obviously a shot at Microsoft). Available right now for iOS devices (an Android version is coming soon), when you begin, the app will prompt you for an email address. When we inputted a Gmail address, it asked us to log in using Google authentication. However, when we used a Yahoo email, we received a prompt for a username and password. We suspect that it’s because by syncing with Google, Quip could eventually access files in Google Drive to import into the service — at this time it doesn’t. As Quip has a social layer to it, it will then ask you to invite your friends to use it — of course you can skip this feature. On the default interface, it’s your dashboard akin to what you might find on Evernote. It lists your documents and folders. 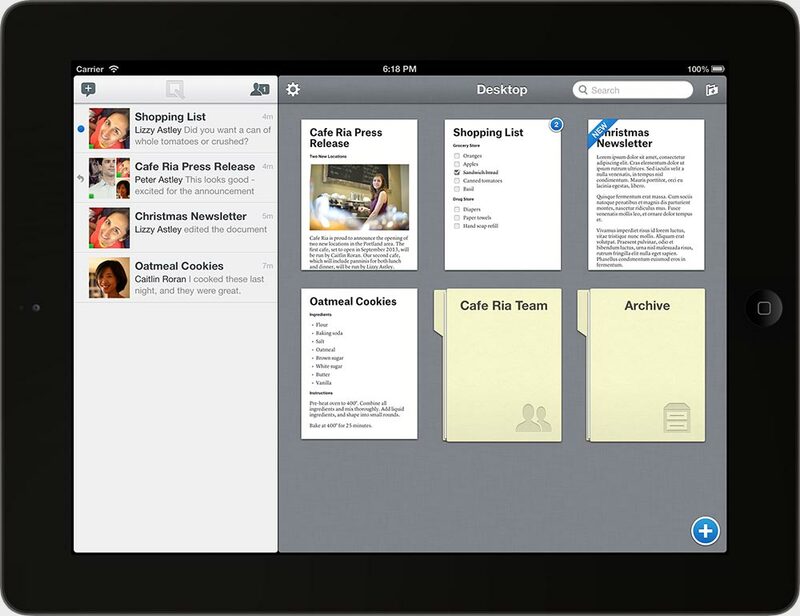 Users can create new documents simply with the tap of a button. When we created a new document, we saw a clean interface, almost like using a no-line notepad. Above the keyboard are three formatting menus. The first one lets you adjust the paragraph format so it can either be body copy, a header (small, medium, or large), or a list (bulleted, numbered, or checklist). 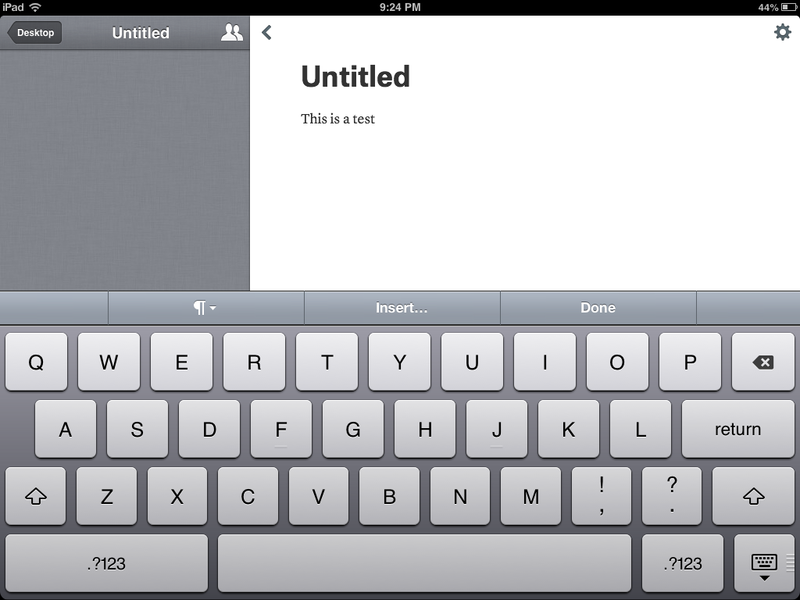 The next button inserts objects into the document, including images, a table, a mention, or a document. The WYSIWYG-style editor on Quip is definitely simple in nature, giving you just enough to craft a fairly decent document — putting your focus on what you’re writing, rather than the bells and whistles of the software. Saving documents is also pretty fascinating. 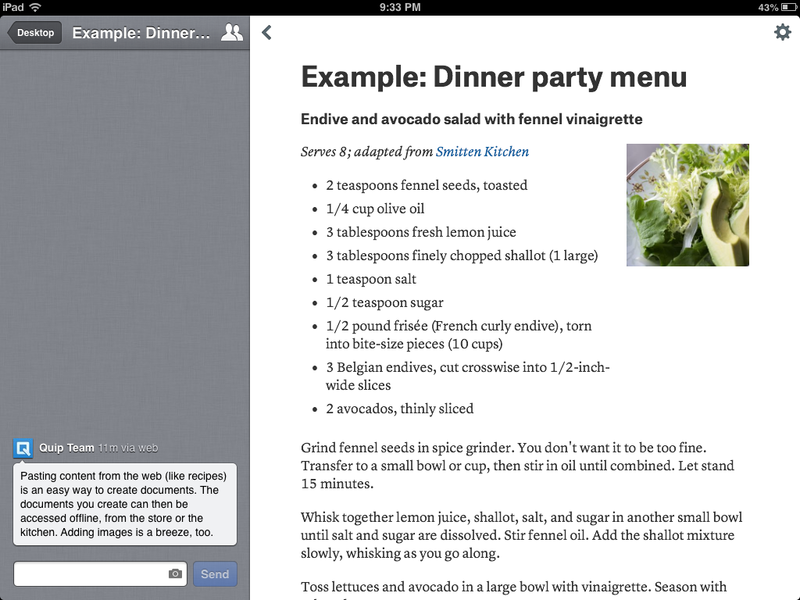 Since Quip utilizes the cloud, once you’ve made edits to a document, it will be reflected across all devices. In near real-time, the updated document appears right in the desktop version. Sadly, while files can be downloaded as PDFs, they cannot be saved as another format — at least not yet. What’s more, Quip currently has no feature to enable users to upload their own Word documents, which may turn some people away in the short term. Quip is a simple to use application that almost combines the collaboration features of services like Yammer with Google Docs. What would be interesting to see is whether or not it will integrate with a cloud storage service like Dropbox or Box. In the future, it could clearly be integrated with the former’s platform offering, which was revealed at DBX this month. With the latter, Quip could be a part of its OneCloud service. Start of a software (r)evolution? Taylor and Gibbs believe the slate of current tools being used in the workplace are outdated and fail to work across all platforms. However, how their creation stacks up against the likes of Microsoft’s Office 365 cloud offering and Google Docs remains to be seen — maybe Quip is hoping simplicity will win it more users in the long term. Personal usage of the app is free (for up to 5 users), but the company is implementing a subscription-based service for businesses with plans starting at $12 per month per user (up to 250). An enterprise version is also in the works. As mentioned earlier, Quip is currently available on desktop and iOS devices. An Android preview release version is available in the Google Play, but the final version isn’t ready yet.